We’d love your help. Let us know what’s wrong with this preview of Fangtastic Tales of Werewolf Savagery by Toneye Eyenot. La Lluna Plena – the Full Moon – that beautiful and mysterious celestial body which stirs within us all those deep, dark emotions we do our best to subdue and control. For some of us, her influence runs deeper, much deeper. We all walk beneath her maddening rays, yet, while most may shrug off the notion that inside us all resides a beast – a savage wolf – there are those o La Lluna Plena – the Full Moon – that beautiful and mysterious celestial body which stirs within us all those deep, dark emotions we do our best to subdue and control. For some of us, her influence runs deeper, much deeper. We all walk beneath her maddening rays, yet, while most may shrug off the notion that inside us all resides a beast – a savage wolf – there are those of us who embrace the monster within and ride that lunatic wave with abandon each time she casts her gaze upon us. To ask other readers questions about Fangtastic Tales of Werewolf Savagery, please sign up. So now, along comes this collection of short stories, and I just had to take another trip under the full moon with Toneye. This collection is made up of 5 tales of savagery and it opens with a bang. The first story I would actually classify as a novella. It made up of 50% of the collection on my kindle. The story “Blood Moon Big Top” follows the clown Marbles. I liked the character of Marbles and I’ve not read a lot of werewolf/clown tales before, so this was a nice, fresh take on the familiar plot line. We follow Marbles, and the circus, as he gets savaged and transforms. This was a decent tale, but at points I felt it dragged on in some sections. Maybe it was because I didn’t realize it was a novella length and wondering just when it was going to wrap up, but ultimately I enjoyed the story. The second tale was a good romp through werewolf lore. “Hunter’s Moon” had a very similar feel as “Wolvz: Whispers of War” but I found the length of this tale suited it perfectly. The third tale brought us another gorier offering with “Dire.” Having it involve a museum, an artifact and a collector was a great addition. Really enjoyed this one and I think in the future, I’d love to see more ‘National Treasure/Werewolf’ mash-ups. The fourth tale was aptly titled “Human Skin.” We get a nice little tale about a crime scene, some detectives and a wondering of what just happened. The last tale offered up “The Tomb of Legion” wasn’t a story I enjoyed very much, but that’s because I’m just not liking vampire tales for the most part right now. This pitted werewolves and vampires in a splatter filled tale. Reminded me a bit of the Underworld movies and I can see this becoming a fan favourite for Toneye. The collection concluded with a bonus look at “Wolvz: Whispers of War” which I skipped by, having previously read it. I loved the variety of plots and back stories offered up here. It’s great to see that in a ‘simplistic’ genre such as “werewolf” Toneye did a stellar job showing us that he’s not a one trick pony, but also that the genre can have great depth and that the stories themselves are capable of not becoming repetitive. I wish the first tale was a bit shorter and I personally didn’t enjoy the last tale, but it was still a fun read. Due to my thoughts on Fangtastic Tales of Werewolf Savagery, I feel it’ll be easier for me to break down what worked for me & what didn’t work for me. Fangtastic Tales.. is a short story collection that focuses solely on werewolves; hence the title. Starting at the surface, holy hell @ that cover@?#! @# Listen, we shouldn’t judge a book by its cover, but Fangtastic Tales of Werewolf Savagery has such amazing artwork! I was instantly drawn in by its color scheme & design. Hecki Due to my thoughts on Fangtastic Tales of Werewolf Savagery, I feel it’ll be easier for me to break down what worked for me & what didn’t work for me. Fangtastic Tales.. is a short story collection that focuses solely on werewolves; hence the title. Starting at the surface, holy hell @ that cover@?#! @# Listen, we shouldn’t judge a book by its cover, but Fangtastic Tales of Werewolf Savagery has such amazing artwork! I was instantly drawn in by its color scheme & design. Heckin’ beautiful. I would also like to shout-out Toneye Eyenot for being passionate about their genre. The request e-mail I got from them was so howlin’ fun, I just knew I wanted to work with them. I truly appreciated the variety of each story. Yes, it’s all about werewolves — but there’s so much range between each short. From a drifter clown turned werewolf to a story that plays on werewolves vs. vampires. I absolutely adored Toneye’s creativity & originality. Plus, IT’S A BLOODY GOREFEST, ghouls. I am a true sucker for a story covered in gore. I was definitely not let down when it comes to bloodshed & cringe-worthy moments. My favorite short would have to be the longest of the collection, Blood Moon Big Top. This story focuses on Marbles the Clown who ends up transitioning into a werewolf. I really loved the circus meets werewolf tale aesthetic. However, there are some things I didn’t like about this story (i.e. child death, which some people are able to handle better than others! If you don’t mind a gruesome scene where a child gets mauled by a werewolf, than feel free to ignore this trigger warning). There was a huge disconnect between story & reader, in my case. Even the longest short, Blood Moon Big Top, had me wanting more of something. This is probably the most-developed of the collection & yet, I didn’t feel anything while reading. This was a collection of 5 short stories that celebrate everything Werewolf. The authors passion for the subject matter is clear in his storytelling, there is plenty of gore and grizzly imagery, as you would expect. I enjoyed the fact that most of the stories were told from the Werewolf’s POV. There were some really good inner conflict scenes in ‘Blood Moon Big Top’ after Pebbles the clown gets bitten and undergoes the transformation from human to Werewolf, as he battles with his human conscience and animal impulses. Unfortunately I did struggle with this collection, I found that with all of the stories being on the same subject, the language and descriptions felt repetitive, there was no real depth or sense of direction to the stories which is a shame, this one just wasn’t for me. If there was ever someone in this world that could be a real werewolf, I would believe that person would be Toneye Eyenot. This man virtually lives, breaths and thank the moon, writes werewolves. Toneye's newest release, FANGTASTIC TALES OF WEREWOLF SAVAGERY is a collection of five stories. Each story is a different take on the wolf, but they all feel like they could be taking place in the same world. This web of inter-connectivity creates a feeling of falling into a mythos created out of the bla If there was ever someone in this world that could be a real werewolf, I would believe that person would be Toneye Eyenot. This man virtually lives, breaths and thank the moon, writes werewolves. Toneye's newest release, FANGTASTIC TALES OF WEREWOLF SAVAGERY is a collection of five stories. Each story is a different take on the wolf, but they all feel like they could be taking place in the same world. This web of inter-connectivity creates a feeling of falling into a mythos created out of the blackness of the authors nightmares. Toneye treats the werewolf as the main character. No beast taking the back seat to a hero looking to save the day, or a girl in a red hood trying to lead it astray. The wolf is front and center, and that is what I really enjoyed about the tales. I have always loved a good werewolf story and it is so spectacular to see the wolf be set free. And these are proper werewolves, not your over-sized cuddly dogs chasing sparkly vampires. They are bloody, savage killers, rending flesh and chewing on bone. Lets take a look at the stories included in this book. This doozy of a tale follows a clown named Marbles. He is a loner who enjoys his solitude between shows with a traveling circus. One night while out for a walk he stumbles across a feral child in the forest and and gets bit on the hand. Little does Marbles know that this one event will make life as he knows it spiral out of control and lead him down a path of blood and death. This is the longest story in the collection and boy does it deserve to be front and center. We see this man slowly and methodically start fighting with his own humanity. We all know that he will lose to the wolf in the end, but the journey to that point is a roller-coaster ride of emotions. As Marbles looses his battle to the beast, he partakes in murder after murder to feed his growing hunger. Each one more gruesome then the last as the full moon approaches. Toneye does not hold back on the gore. The deaths are horrible and vicious and keep building until one of the biggest blood-soaked conclusions you will ever read. A pack of werewolves in the Blue Mountains of Australia prepare for the night of the Blood Moon and The Great Hunt. They have gathered their prey from the surrounding community of humans and when the time is right they will be released and the wolves will hunt. This tale gives a good look at the Pack dynamic of this group of werewolves. Each member is different, but when the hunt begins, they are one. The common goal, hunt and kill the human prey. A thief takes a job to steal a fossilized paw print from the natural History Museum. It is a strange artifact, and when he returns to the man who hired him, events take a strange and deadly turn. This story, with it's quick lead in and finale, reminded me of a Outer Limits episode. Just a nice little satisfying compact story. Two Private Investigators at a gruesome crime scene try to decipher the truth about a mangled body. Was this a stray animal attack or something far more sinister. And what could the old man who lives alone by the old docks have to do with it. Hard Boiled crime and werewolves. I could read a whole book on this topic alone. It's werewolves vs vampires (not the pretty sparkly ones) in an all-out battle of supremacy. And we even get some witches thrown in for good measure. Out of the 4 shorter stories in this collection, this is my favorite. Who doesn't love wolves and vamps tearing into each other. The author gets to let loose and creates some real carnage on the page. We even get a ending that leaves the door wide open for a new chapter. As a bonus, a excerpt from the authors other novel, WOLVZ: WHISPERS OF WAR is included at the end of the book. The moon is full tonight, so grab your copy and howl away. The night of the wolf is just beginning. Anyone familiar with Eyenot’s other works will know that he has a fondness for werewolves, and this collection of works provides a fantastic example of his talents as a writer. Comprised of a number of short tales, Fangtastic Tales of Werewolf Savagery is a brutally good read. I received an ARC of Toneye Eyenot's book Fangtastic Tales of Werewolf Savagery and can straight up tell you this book will feed your need for those in love with werewolves. Werewolves are a special breed of the supernatural scary to a lot of people for the hairy pelt lies inside and doesn't show except when the hunger is there. And you are on the menu. 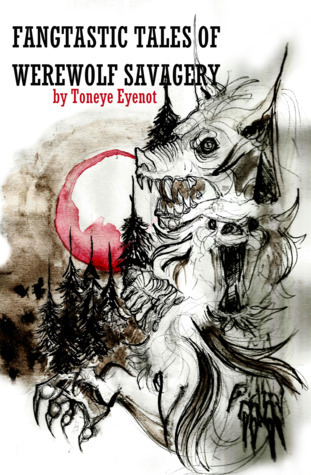 One of the few writers who can handle this genre of horror in a powerful way and lead you into the thought mind of how they think, their attacks I received an ARC of Toneye Eyenot's book Fangtastic Tales of Werewolf Savagery and can straight up tell you this book will feed your need for those in love with werewolves. Werewolves are a special breed of the supernatural scary to a lot of people for the hairy pelt lies inside and doesn't show except when the hunger is there. And you are on the menu. One of the few writers who can handle this genre of horror in a powerful way and lead you into the thought mind of how they think, their attacks and attitudes is Toneye Eyenot. He doesn't shy away from the grizzly details. Faced with a meeting of werewolf and human, you know the result. You'll find raw power and savagery in these stories with no apologies as to who fills their appetites. The crown jewel in this volume is Blood Moon Big Top and in my mind (if it be possible) flawless in its execution. The remaining stories (short ones) continue celebrating those who howl in the night and make your blood run cold. Your scent carries on the wind and they will find you. The hunt awaits and invites you to run with the pack. I appreciated the gore, and definitely appreciated that there was no romance, as too often seen in werewolf books. I liked that the last story had vampires. I liked this from the first page to the last. Its really interesting, and well worth reading. Five stars, and look more from the author.